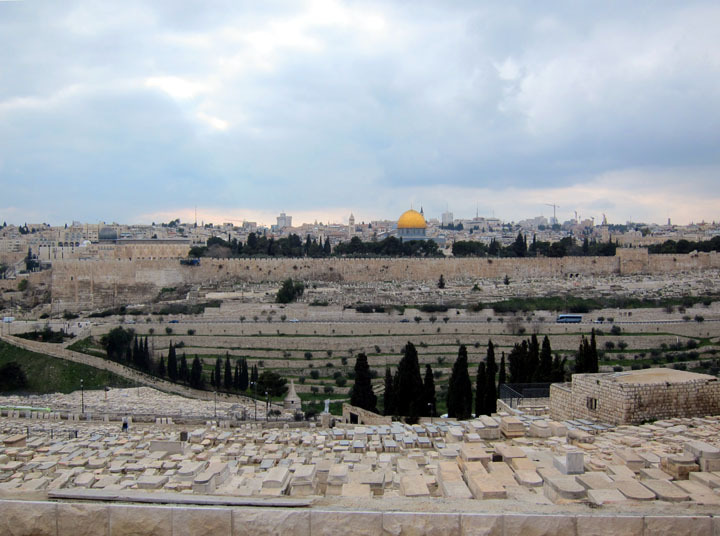 Southern view of Jerusalem from the Mount of Olives. I’m back from two weeks in Israel! It was an incredible trip filled with history, archaeology, art, religion and cultural experiences. I visited Tel Aviv, Jaffa, Acre, Nazareth, Cana, Tiberias, the Sea of Galilee, some of the Southern desert, the Dead Sea, Bethlehem and of course Jerusalem! What a trip! The jet lag is wearing off and I’m starting to go through my pictures now, so I’ll be bring you more stories shortly. But for now, here’s a classic view of Jerusalem – one of the best “old cities” I have ever explored. Beautiful photo! I can’t wait to read more about your time there. Thanks Tricia! Yes I definitely took a float in the Dead Sea – even though it was only in the low 60’s. A tremendous thunder storm had rolled through just before. The colors in the sky and sea were incredible.